Destiny Players: How Much Have You Spent On Microtransactions? Today, Bungie added some expensive, unexpected microtransactions to Destiny that will let players level their characters (slightly) faster in exchange for (a lot of) real-world money. In light of that news, I’m curious how much y’all have spent on the game so far. 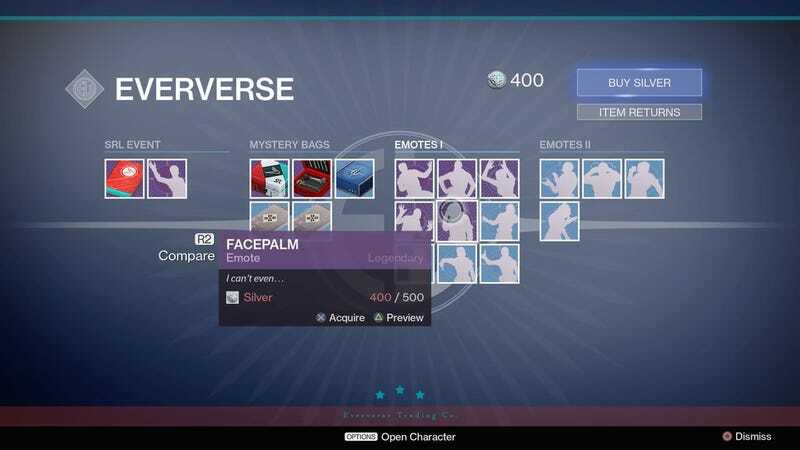 Back when Destiny’s in-game microtransaction system launched, we polled readers on which emotes they’d purchased. Now that we’ve had a few events like The Festival Of The Lost and the Sparrow Racing League, the number of things players could theoretically spend their money on has greatly expanded. Sounds like a new poll is in order! Notes: If you want to go back and check your purchase history, that’s great, but you can also just ballpark it. I’ve rounded up, so if you bought a single $4.99 pack, that counts as $5. If you haven’t played Destiny, you could accurately say you’ve spent zero dollars on microtransactions, but let’s keep the voting to actual Destiny players, yeah? I’m curious to see the numbers on this one.